May 27, 2010 - In its first flight attempt, the Boeing X-51A WaveRider today successfully completed the longest supersonic combustion ramjet-powered flight in history nearly three and a half minutes at a top speed of Mach 5. The unmanned aerial vehicle was released from a U.S. Air Force B-52H bomber off the southern California coast around 10 a.m. today. It flew autonomously for more than 200 seconds, powered by its Pratt & Whitney Rocketdyne supersonic combustion ramjet (scramjet) motor, as it transmitted telemetry data to ground stations. Something then occurred that caused the vehicle to lose acceleration. At that point, the X-51A was terminated as planned. "The technology proven today is something The Boeing Company has worked on for the past seven years," said Alex Lopez, vice president of Advanced Network & Space Systems, a division of Boeing Phantom Works. "It is thrilling to be a part of history and advance hypersonic science to the next level. Boeing is looking forward to transitioning the technology to operation in the near term, but for now, we are exhilarated." Even before analyzing the terabytes of telemetry data transmitted by the X-51A during flight, Air Force officials called the test an unqualified success. "We are ecstatic to have accomplished many of the X-51A test points during its first hypersonic mission," said Charlie Brink, X-51A program manager with the Air Force Research Laboratory at Wright-Patterson Air Force Base, Ohio. "This gives us huge confidence. We built four test vehicles to get a successful flight, and we hit many of our goals right out of the gate, the first time around." 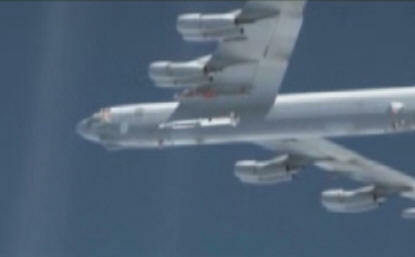 The X-51A was carried aloft under the left wing of an Air Force Flight Test Center B-52H Stratofortress that took off from Edwards Air Force Base. It was released while flying at approximately 50,000 feet over the Point Mugu Naval Air Warfare Center Sea Range. Four seconds later, a solid rocket booster from a U.S. Army tactical missile accelerated the X-51A to about Mach 4.5 before it and a connecting interstage were jettisoned. The X-51A's engine ignited on a mix of ethylene and JP-7 jet fuel. After a short period, the X-51A ran exclusively on JP-7 jet fuel. The flight reached an altitude of about 70,000 feet and an approximate speed of Mach 5. Onboard sensors transmitted data to both an airborne U.S. Navy P-3 Orion and to ground systems at Point Mugu, Edwards, and Vandenberg Air Force Base before the X-51A was terminated. The team will review the data from today's test before scheduling additional flights with the three remaining test vehicles. "This is a new world record and sets the foundation for several hypersonic applications, including access to space, reconnaissance, strike, global reach and commercial transportation," said Joe Vogel, Boeing director of Hypersonics and X-51A program manager. Boeing Phantom Works, a division of Boeing Defense, Space & Security, performed the overall air vehicle design, assembly and testing for the X-51A's various components. The X-51A program is a collaborative effort of the Air Force Research Laboratory and the Defense Advanced Research Projects Agency, with industry partners Boeing and Pratt & Whitney Rocketdyne. The vehicle's fuel-cooled engine design serves both to heat the JP-7 to an optimum combustion temperature and to help the engine itself endure extremely high operating temperatures during the long burn. Program officials noted that while development of the vehicle's engine and the test program are complex, controlling costs has been a key objective. The team has adapted existing proven technologies and elected not to build recovery systems into the flight test vehicles. A unit of The Boeing Company, Boeing Defense, Space & Security is one of the world's largest defense, space and security businesses specializing in innovative and capabilities-driven customer solutions, and the world's largest and most versatile manufacturer of military aircraft. Headquartered in St. Louis, Boeing Defense, Space & Security is a $34 billion business with 68,000 employees worldwide.